Employer’s liability insurance covers the cost of the injuries and loss to the person affected. premium increases.....and the list goes on! It’s these uninsured costs that I want to look at - where the money financing them comes from and what factors may influence those in the decision making process. Businesses can be represented as a triangle. At the bottom we have operators there are more operators than supervisors, more supervisors than management and etc, etc, moving up the triangle. As you move up the organisational chart your salary increases. 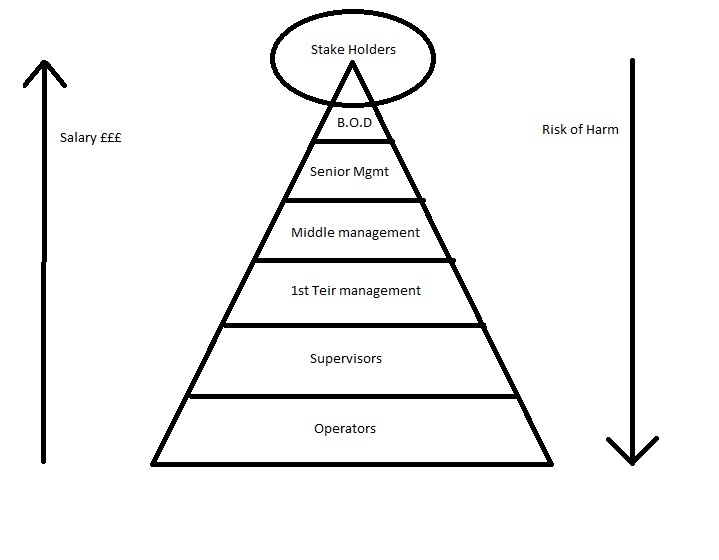 The lower down the organisational chart you are the greater the risk of harm you are exposed to. What I mean to say by that, is if there is an accident in your organisation it is far more likely that it will be an operator or a supervisor that winds up in hospital rather than a middle or senior manager. At the very top of here sits the stake holders such as banks, shareholders and others. 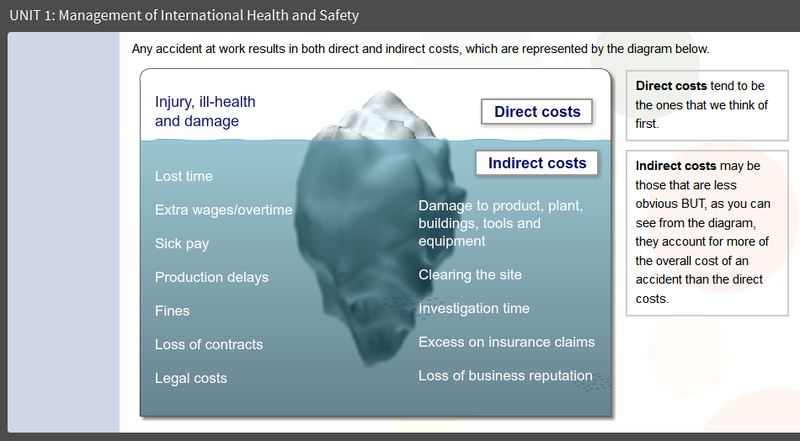 All workplace accidents result in costs - direct and indirect. It is the latter that ironically will directly affect the capacity of the business to meet shareholder expectations. Let’s say that we have had an accident and our ELI has paid out £10,000 in damages then according to the iceberg effect outlined in HSG 96 where insured costs : uninsured costs are something like £1 insured : £10 uninsured, this means that we are looking at £100,000 deficit of uninsured costs following this accident. So my question is, where does that £100,000 come from? When asked, lots of peoples' answers to this are profits or the business however, there are significant drawbacks in this. Towards the end of each financial year accountants and financial forecasters 'crunch' numbers until they come up with a figure of projected business growth for the next financial year. This number must be above the rate of inflation at large enough to offer stake holders reasonable compensation for the risk of investing their funds within the company. So let us say that the company commits to growing by 8% the following year and that this is 4% above the rate of inflation. This 8% growth is what the board of directors promise to the stakeholders. By hook or by crook the company will have to hit that number, if they don’t (because for example; we have accidents and we take that money from the business’s profit) then the negative effects will start to be felt. Firstly, the company will fail to achieve its promise of being a lucrative investment to its stake holders, then said stakeholders may lose faith in the organisation and decide to re-appropriate their investment funds into other, better performing businesses. 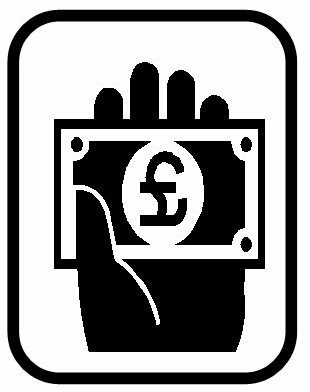 This re-appropriation may take shape by the banks re-calling their loans, restricting the volume of money the organisation can borrow, making it far harder to secure funds in the future or refusing to lend money to our business. This can directly affect the businesses short term 'survivability' as well as impact its long term profitability by limiting capital funds for growth projects. This re-appropriation may come in another form; of the share holders selling their shares, at which point more and more of the organisation is available on the free market. If there is another entity acquiring these shares, then they may get to own enough to put themselves in a position for a takeover or merger, gain a controlling share of the business and in short, commence a forceful acquisition or take over. So taking money from the business / profit is an option but it comes with some downside risk. Let now explore some other avenues available to recuperate the lost funds. To make more money, the first thing that we should appreciate is that here we are handicapped by our turnover : profit ratio. For easy arguments sake, let us say that this is 10:1. For every £10 of customers money coming in the front door, after we have paid all of our overheads, staff, maintenance, rent, loan repayment etc we are left with £1 of pure profit. This means that through this method we would be looking to have to make £1,000,000 to cover a deficit of £100,000. With this in mind our first step would be to approach our sales team who will already have been given very aggressive targets to achieve, would now need to find an extra £1M worth of business. If this was easily possible, the sales director would have to answer some tricky questions for a start. The business is unlikely to be able to recover all the costs this way. We could examine raising the prices; this may bring a short term windfall but have the long term drawback of pricing the company out of the market and losing future business as a consequence. A final consideration is that operations must have the business slack to be able to handle and extra £1,000,000 worth of business without significant capital investment into infrastructure or people. Now let us examine option 2) saving money. The instant advantage here is that we operate on a 1:1 ratio, every £1 saved is £1 taken straight from the £100,000 deficit. This number now seems far more palatable when compared to the £1,000,000 required of a money-making strategy. So how can the company save money? Well a key consideration here is to not affect operational capacity as this will handicap the revenue the business can make. We could sell plant and equipment that would liberate some cash. Commonly the amount raised would be only a fraction of its wealth and contribution to the business. Also the amount raised would be less than the cost to replace it in the plant and equipment. Another solution to bring to the table is we find six people on a £20,000 salary each; our first targets would be newest starters, admin, possibly the worst performing of the sales and operation team to act as a “team motivational tool”. What we don’t want to do is impact the business’ ability to earn money. In this single stroke of 5 redundancies we have cancelled our deficit. Now, I’m not saying that this is how financial deficits are cut as the result of an unforeseen event. But if we agree that the money cannot come from our profits then this problem exists and these type of solutions may be put forward for discussion. Typically these discussions are going to take place within senior management and the board of directors. For examples of this situation in recent memory, think of the 2008 recession. The amount of profit forecast by an organisation must be met by hook or by crook. With less money as disposable income, less people spending many companies took the action to cut costs in an attempt to maintain their promises made to stake holders to grow above inflation which at its height was at a whopping 5%. Now this number has to play by some rules, firstly it must be greater than inflation, all businesses must grow above the rate of inflation or find themselves devaluing year on year. Secondly the business will look to grow a healthy chunk above the rate of inflation to provide shareholders with confidence in their investment by an increase in value of share price to compensate them for the risk of handing their hard earned money over to somebody else. This is how pension schemes work, they take money each month and invest it in businesses that state that they are going to grow above the rate of inflation and then some, so that the money in 40 years time (well for my generation probably more like 50, to 60 years before I will be allowed to retire) will be worth more than people have paid into it in the years up to retirement. Tom is Opeations Director at Astutis and a Health & Safety consultant with particular experience in the delivery of IOSH and NEBOSH accredited courses. He has a proven track record in the delivery of these courses to clients across a wide range of industry sectors including Aviation, Engineering, Manufacturing, Rail and Utilities. With accomplished training skills and experience of delivering the NEBOSH Certificate, he has a track record of helping delegates to achieve excellent pass rates 40% above the national average.